Sales edged up in the fiscal 2019 first quarter at Sobeys Inc. parent Empire Company Ltd., but earnings fell short of analysts’ forecast. For the quarter ended Aug. 4, sales rose 3% to $6.46 billion (Canadian) from $6.27 billion a year earlier. Sobeys accounts for virtually all of Empire’s revenue, which also includes income from the Crombie REIT and real estate partnership. Same-store sales were up 2.3% overall. But the company said the increase was 1.8% excluding fuel and pharmacy and 1.3% excluding only fuel. Empire said the first-quarter sales gains reflects the impact of promotional and marketing activity plus growth in traffic and basket size at Sobeys, along with higher fuel sales stemming from increased gas prices. The company noted that same-store sales were higher in most areas of Canada, and volume was positive for the quarter. Deflationary effects from drug pricing reform and the closing of 10 stores in western Canada partially offset some of these positive factors, while inflation was flat. Gross profit dipped 1.2% in the quarter due to the store closings, higher transportation and other costs, and lower pharmacy margins from the effects of health care reform and a ban on rewards for prescription drug purchases under Alberta Air Miles loyalty program, Empire reported. Gross margin fell 1% to 23.4% because of lower-margin fuel sales, increased transportation and other expenses and changes in product mix in Quebec. The company noted that average margin rates in Quebec were affected by changes in the ratio of corporate to affiliate stores and higher sales of lower-margin products. At the bottom line, Empire posted fiscal 2019 first-quarter net income of $95.6 million, or 35 cents per diluted share, compared with $54 million, or 20 cents per diluted share, a year ago. The results reflect $4.6 million in intangible amortization from the Canada Safeway acquisition, while the 2018 quarter included $4.8 million in intangible amortization from the acquisition plus $28.7 million in costs from Empire’s Project Sunrise initiative. Adjusted net earnings came in at $100.2 million, or 37 cents per diluted share, for the 2019 quarter, versus $87.5 million, or 32 cents per diluted share, a year earlier. On average, analysts had projected adjusted EPS of 42 cents, according to Zacks Investment Research. Meanwhile, Empire reported that Project Sunrise — its three-year project to simplify organizational structure and reduce cost — remains on track. Launched in the fiscal 2017 fourth quarter, the initiative targets at least $500 million in annualized benefits by fiscal 2020. Empire said 20% of that goal was realized in fiscal 2018, and management expects another 30% to be realized in the current fiscal year. “We continue to be confident that we will realize benefits of our Sunrise category improvement initiatives in the second half of the year,” Medline stated. Over the next five years, Sobeys plans to convert up to 25% of its 255 Safeway and Sobeys stores in western Canada to the FreshCo banner. Seeing the discount segment as a higher-growth avenue in food retail, Sobeys also is expanding its FreshCo banner. In fiscal 2018, the retailer said it aims to convert up to 25% of its 255 Safeway and Sobeys stores in western Canada to the FreshCo banner over the next five years. 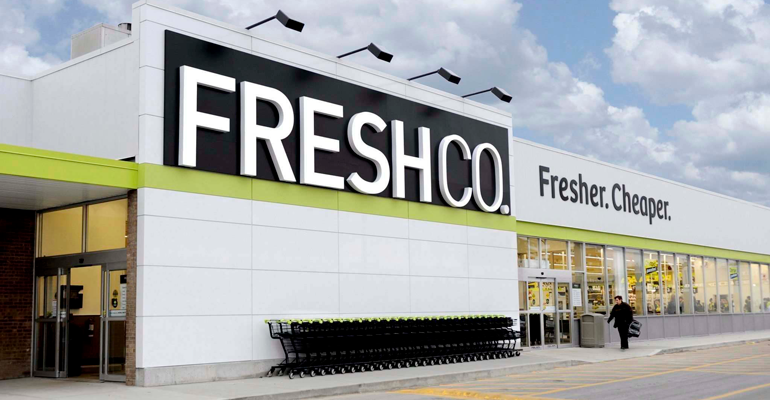 The first two converted FreshCo stores are slated to open next spring in Winnipeg, Manitoba. During the first quarter, Sobeys opened, relocated or acquired 10 stores; expanded one store; rebannered or remodeled two stores; and closed 10 stores.